13-year-old Pandora Atheneus Andromaeche Helena (or Pandy, for short) has no idea what she’ll bring for her school project. By accident she discovers a simple box, said to contain something so terrifying and horrible that no one must ever, ever touch it for fear of inflicting all of mankind with the wrath of the Gods and Goddesses. This, of course, makes the box the perfect thing for Pandora to bring for her school project. Unfortunately, things don’t go quite the way she was hoping, and the box accidentally gets opened, unleashing all kinds of evil and misery into the world. Hauled before Zeus, Hera and the rest of immortals, Pandy’s given the task of collecting all the evils within a year’s time. There are the other exciting books in the Pandora series: Pandora Gets Vain, Pandora Gets Heart, Pandora Gets Lazy, and Pandora Gets Angry. About the author: Carolyn Hennesy has been an actress for many years, appearing in films and primetime television shows such as Legally Blonde 2, Dawson’s Creek and That 70’s Show. She can currently be seen on the daytime drama General Hospital. In her spare time, Carolyn teaches improvisational comedy and has become a flying trapeze artist. She lives in the Los Angeles area. “I was completely blown away by how incredilbly good this book was. I know this is a bold statement, but I would compare it with the best of Gregory Maguire (Wicked, Son of a Witch, Confessions of an Ugly Stepsister). It combines Greek myth, history, modern refrences, adventure and a laugh out loud sense of humor. When your father is an immortal Titan, your mother is a personal assistant to Zeus (and she is quite a beauty), your uncle holds the weight of the world on his shoulders and you are a demi-god, you would think that life would be a breeze. But not so for 13-year-old Pandora Atheneus Andromaeche Helena (but you can call her Pandy). Pandy has a lot to live up to. The other maidens at school are always picking on her because she is somewhat plain looking and has an overbite and freckles. Her grades are less than perfect and her best friend is a relative of Medusa. Poor Pandy always feels like a dissapointment to her god-like parents and she wants nothing more than to make them proud of her and she wants to show the rest of her class that she is special. Which is why she brings a box containg all the evil and misery of the world to school for a class project. She’s sure she will get an alpha on this project and make everyone proud. Unfortunately, the box is accidentally opened and the evils are released into the air in colorful puffs of smoke. This will not make her father happy. The rest of the gods and goddesses are even less happy about her mistake. She is summoned to a council to receive her punishment, which is to recapture what she has released onto humanity, and she doesn’t have much time to do it. It’s a big task for a little girl but she will never be alone in her quest. She has friends in very high places. So she sets off on her journey to capture the first evil, jealousy. Pandora’s story is loaded with adventure and hilarity. For example, we find out that the reason Zues’ wife Hera dislikes Pandy has something to do with cookies, Hermes actually had the first cell phone and the goddess Demeter promises to help rid the world of “cooties”. I laughed out loud and was at the edge of my seat. Also, if you are not familiar with Greek myhtolgy and terms, not to worry. There is a handy glossary in the back of the book with definitions and correct pronunciations. Pandora Atheneus Andromaeche Helena, “Pandy” to her friends, is the only daughter of the Titan, Prometheus. She has just turned thirteen and is officially a “maiden” now. The problem is, her life is so boring. While there are people all over Greece doing wonderful, heroic things, Pandy and her friends Iole and Alcie are still in school. To make matters worse, a big project is due. Pandy must find a way to show the presence of the gods in everyday life. She knows she has to come up with something amazing this year. And then, Pandy finds a box that belongs to her father; the one that he has been entrusted with. It couldn’t hurt to borrow it for just a little while, right? After Pandy’s project, the box opens, unleashing all of the evils into the world. Pandy manages to close the box before the last item escapes. Hope is left, trapped in the box. Now Zeus has told Pandy that she must find each plague and return it to the box. It is a task she must complete without the help of her father. To make matters worse, Hera has it in for Pandy. None of the gods would dare defy Hera to help Pandy, would they? So, Pandy sets out, her two best friends at her side, to rescue mankind from the doom that has engulfed it. Her first task is to find Jealousy, and return it to the box. Pandy has a time limit in which to rid the world of these evils. Is there any way a maiden can accomplish such a daunting task? These deals as the name implies are updated daily and usually entail Kindle eBook being sold for nominal $0.99. You can keep track of them here: The Kindle Daily Deal. Or you can follow our blog as we’ll keep track of these deals too. 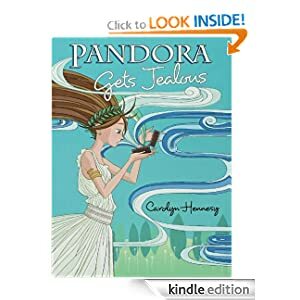 This entry was posted in Kindle Books, Kindle Daily Deal and tagged Carolyn Hennesy, Pandora Gets Jealous, Pandora Series by Paul. Bookmark the permalink.